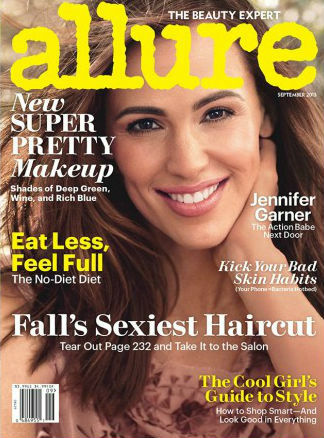 –Jennifer Garner looks great (and crazy young) on the cover of Allure, in which she says she stopped walking the red carpet with Ben Affleck because women “can really lose their identity and just become ‘wife of. '” (This doesn’t seem to stop her from endless family Starbucks runs during Oscar season, though.) She also said that she wouldn’t be surprised if her husband went into politics. –Gwyneth Paltrow‘s bodyguards allegedly acted like jerks at the library fundraiser. This tweet is everything. –Justin Bieber treats his dates to “large McDonald’s french fries.” Swoon! –Prince Harry and The Wire’s Dominic West together in a remote locale? Ohhh, I’ve had this dream! –Bill Hader and Jonah Hill are going to headline the roast of James Franco. -This is Anna Kendrick’s adorable reaction to having a song on Billboard’s top 10 for five weeks in a row. -Here are some photos from the set of Girls season 3. Hannah can afford a Cambridge satchel? Really? –Stephen Colbert revealed the truth behind that Daft Punk dance party: it wasn’t just MTV that put the kibosh on their appearance, it was the band itself. -Jimmy Fallon is opening up on his and his wife’s fertility struggle and their decision to use a surrogate. -Weirdest celebrity feud of the week: Val Kilmer vs. Betty White. Kilmer clearly just can’t let the Grammy thing go. –Oprah says she’s “sorry” for the media firestorm following her claims of racism in Zurich, and insists “no apology is necessary.” She got one anyway. -Meanwhile, Opes looked great at last night’s premiere of The Butler. -I love this interview with Keri Russell on Austenland. When the reporter mentions The Jane Austen Fight Club, she says “Stop right now and tell me everything you know!” And then when she sees the “Hey, Girl” Ryan Gosling meme, she totally loses it. Is there no internet where she lives? –Britney Spears spent $6.8 million last year, but that doesn’t means she doesn’t love a bargain. Court records indicate that she regularly frequented dollar stores and fast food restos. –Amy Poehler just dropped another awesomely wise Ask Amy video. -This is creepy as all get out: Famke Janssen recently came home and found a copy of The Lonely Doll in her bedroom. Only problem is: she doesn’t own that book. –Meryl Streep just took herself out of the running for Best Actress Oscar, submitting for Supporting Actress instead. Oh, snap! -This might be the best comment about the Breaking Bad premiere ever. -You can stream the new Superchunk album here. I love you, internet! -Just in time for The Butler to hit theatres, Terrence Howard has been accused of being a violent jerk…again. -Jennifer Aniston reportedly changed her flight to avoid flying with Angelina Jolie. –Liam Gallagher has a lot of secrets, apparently. –Kendrick Lamar is trying to start beef with Drake (and pretty much everyone else in hip-hop). -The first trailer for John Turturro‘s new film Fading Gigolo, which is coming to TIFF, has landed.